Dear Members of The Mother Angeline Society,Greetings to you in this early fall moment. As members of The Mother Angeline Society, you and your intentions were remembered in the Novena of Masses offered leading up to the Solemn Feast of Our Lady of Mount Carmel. As members of the Society, you are always prayed for and all of your needs are placed in the hands of Mary, the Mother of Carmel, that she might show you her maternal love and care. 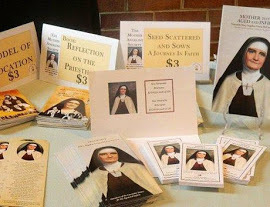 Thank you for your prayerful and financial support that helps to promote the Cause and Charism of Venerable Mary Angeline Teresa McCrory in the Church. “The servant of God, Mary Angeline Teresa McCrory, was a diligent woman, devoted to religion, remarkable for faith and full of charity. Extremely sensitive to the needs of society, she was filled with faith even in adverse and hostile situations and she rendered credible witness to the defense of human life.” This is a powerful sentence. Unlike many of us, the author of this Decree and those who studied Mother Angeline’s life in Rome never met her. They know her only through their research, by reading the testimony given in her Cause and the witness of the documents and accomplishments of the Venerable. Yet, they have – even in these few sentences – touched some qualities of our Carmelite foundress worth reflecting upon in this Year of Faith.The first quality, of course, was Mother Angeline’s faith described as remarkable and filling her. Venerable Mary Angeline’s heart, soul, mind and strength were focused on God, and all of her actions, attitudes and words mirrored that faith. Her faith gave birth to a fullness of charity seen in her dealings with all of her contemporaries. The this is a faith worthy of imitation – a faith that is not first hot, then cold, but always robust! Faith and trust in the Lord enabled Mother, as the Decree states, to give a believable witness even in adverse and hostile situations, and to defend the life and dignity of the elderly.Venerable Mary Angeline Teresa’s faith gave her courage and diligence, additional qualities worth noting. Armed with this courage, Mother and her companions moved ahead even under extraordinarily difficult circumstances. They were never half – hearted. Their confidence in divine providence gave them the fortitude to face every kind of financial or practical difficulty in order to establish up – to – date homes and ministries for the elderly. To this day and through many innovative programs, the Carmelite Sisters courageously seek to serve today’s fragile elderly population and to stand up for the dignity of life against every intrusion. Today’s Sisters carry on with Mother Angeline’s courage and diligence. Finally, there is the quality of charity that so marked our Venerable’s life, love for God and neighbor. Her charity continues in the motto which her Sisters frequently invoke: “The difference is love.” Love humanizes and personalizes medical care; love draws people into relationships of trust and mutual aid; love goes the extra step to take special care of the frail and vulnerable. Not just in the health care ministry but for all of us, Venerable Mary Angeline, a totally loving person, continues to teach us the way of charity. May God bless you and Mary keep you. Please continue to support the efforts of The Mother Angeline Society. Introduce your family and friends to us. Keep the message alive! You are in our prayers.